To call this a blizzard was to do it a disservice. The volume and speed of snowflakes had turned the air into the visual equivalent of a milkshake and although Eira’s was the only car on the road she had still slowed to a walking pace, in an attempt not to slide into a hedgerow or – judging from the weather – a passing polar bear. Each corner in the road was a sharp lesson in the physics of momentum and traction, and the last T-junction had almost resulted in the unfortunate loss of a startled weasel. Country roads were probably not the best place to be on a night like this but Eira’s family had always lived in the back of beyond and as her Dad always said, “it’s good practice for when the zombie apocalypse comes!” So, as ever, she was making her annual festive visit back to the place where she had grown up, before becoming a car mechanic and moving somewhere that didn’t think staring at trees was an enjoyable way to spend your Friday nights. Her parent’s house was in the middle of nowhere and took up enough space for three normal houses, which meant that it was the terminus for the entire clan to meet up on special occasions. She knew without doubt that there would be several uncles and aunts who had imbibed a little too much sherry, a number of nieces and nephews who would be either shouting, laughing at inappropriate volumes or crying, and numerous multi-generational, cross-family arguments which had started in the mists of time and lost any and all meaning – without losing any of their original vim and vigour. She estimated that it would take another fifteen minutes to reach ground zero and was just about to turn onto the small lane which led into the big forest where the house was when she noticed a vehicle at the side of the road. There was a figure standing next to it scratching their head. Being skilled in the arts of car repairs, and with Dad’s jokes looming in the immediate future, she decided it would be churlish to leave someone stranded in the snow on Christmas Eve. She gently pressed the brake pedal and her car snaked across the road and slid to an eventual stop five metres past where she had wanted to end up and facing in the wrong direction. She put on the hazard warning lights then, having come prepared, she reached into the back and grabbed several layers of clothing, pulling them on one at a time until she looked like a furry sumo wrestler, finally a pair of gloves finished the wintery protection and she pushed the door open and shuffled out of the car. There was a bump as of someone hitting their head on the underside of their vehicle, followed by some muted but noisy exclamations of discomfort. Eira was about to apologise for surprising the poor person when several things happened at once. The first thing that happened was that the snow stopped or, to be more precise, it was stopped. She stepped across some kind of threshold between a place where it was snowing and a place where the snow was not there, although she could still see it blasting against the edges of some kind of invisible barrier. The second thing that happened was she saw the “vehicle” which actually turned out to be some sort of sledge, painted red and with a massive runner under each side that rested softly on the snow as if the whole contrivance was as light as a feather. The third thing that happened was a noise like eight heavily built mammals with ostentatious antlers snorting and turning to look directly at her, which turned out to actually be what the noise was. Before Eira’s brain could come to any reasonable conclusions her mouth switched to auto-pilot and said, ‘Actually I normally fix cars, so I might be able to help you,’ and next thing she knew she found herself laying underneath an impossible vehicle, next to a figure whose job title was probably “Seasonal Logistics Distributor”, and looking up into an engine which seemed to inhabit more than the regular number of dimensions. There had been the usual ruckus of greetings as she arrived which slowly tailed off into the regular background white noise of family quarrels. Eira found herself a comfortable seat on the outskirts of the sitting room and set about drinking the cocoa her mum had pushed into her hand with a vengeance. She normally found these gatherings incredibly stressful but, for once, she seemed to be the most relaxed person there. If any of Eira’s relatives had paused in their disagreements long enough to look in her direction they might have noticed that she was sporting a rather snazzy pair of earmuffs, what they wouldn’t have known was that these aural protectors were supernatural in origin and meant that she was unable to hear a single thing which wasn’t said directly to her. This was, she concluded, going to be the best Christmas ever. Anyone who is friends with me on Facebook, follows me on Twitter or, unlikely as it seems, occasionally looks at my Google+ account, will know that for the past two years or so I have been undertaking a reading marathon of Pratchett proportions. I started with The Colour of Magic and continued with all 41 Discworld novels, as well as the maps, cookbooks, tourist guides, kids books and short story collections. After this I started on the non-Discworld books – Strata, The Dark Side of the Sun, the Bromeliad trilogy, the Johnny Maxwell books, etc. The reason for this single-minded readathon are numerous, I tend to reread my Pratchett collection every few years anyway, but after his untimely death in 2015 I couldn’t bring myself to pick up a book by any other author. I assumed this feeling would pass but several months later I was still in the same mood, a year later I felt the same, two years later and I was still in my reading rut. Seemingly unrelated, about two months ago we got notice that our landlord wanted their house back, which was a bit inconvenient because we were just in the middle of trying to find somewhere of our own to buy. Scroll on to about a week ago and the house is full of boxes as we get ready to move to a new rental. I was packing up my Pratchett collection (shudder) and amongst them I found my Kindle, untouched since I picked up The Colour of Magic. I wasn’t sure what to do with it so I left it on top of my drawers in our bedroom. Then, last Sunday night I was getting my stuff ready for work the next day and thought “why the hell not” and slipped the e-reader into my bag. When I arrived at the train station on Monday morning I got it out and started reading (American Gods by Neil Gaiman, if you must know! ), and have been doing so on every journey to work and back since. It seems my reading mojo has returned and, with it, my brain has also fallen off a deep precepice into the icy waters of “I Have To Write” again. Ideas are sloshing around inside my head like a particularly spectacular Formula One pile up and my fingers are itching to type. But what to do first? I’ve been working on a few things, slowly, for the past few months, a Discworld fan-fiction piece about Rincewind; a comedy fantasy novel about a vampire; a biography about my life as a type one diabetic; a kids book I’ve been working on for a couple of years now. All these conflicting stories are arguing for precedence, so what I’m going to do is…go to sleep! Life is complicated enough at the moment without worrying about what and when to write, so I just need to put digits to keyboard whenever I get the chance. I wrote this recently in response to a request for stories to be included in an online magazine. It didn’t quite manage to make it to publication but it was fun to write so I thought I’d share it here. The theme of the issue was Lists, and this is what came to mind, about as far through the year from Christmas as you can get! The list got longer every year but his patience seemed to get shorter. The fire crackled in the hearth. ‘It could be a big lizard?’ The small woman was wearing a jolly green suit, which almost matched the current colour of the big man’s face. ‘How many times have you checked the list, Father?’ She used his honorary title, as it often helped calm him down when he was in one of those moods. Adelaide backed out of the room with a concerned look on her thin face. The elves had been helping out round these parts for thousands of years. Just because the festival had rebranded a few times and swapped icons occasionally didn’t mean that someone wasn’t needed for the production and logistics side of things. In fact elves was a bit of a misnomer, the race was more akin to gnomes, who had excellent fine-motor skills, especially in the footwear department, and a fondness for shiny objects. The historical records suggested the race had been slowly edged out of their natural habitat in the northern hemisphere’s forest tundra, because of man’s ever increasing hunger for land and resources. Eventually they found themselves living in caves carved out of the permafrost and subsisting on a diet of boiled extremophiles and the occasional directionally challenged, and subsequently, extremely frozen avian. When The Big Man took up residence the gnomes decided that a well stoked fire and as many marshmallows as you could eat were preferable to another night of Burkholderiaceae soup, Sphingomonas stew or freeze dried ivory gull with an aperitif of not-quite-thawed ice. The ancient spirit’s eyes, so dark as to be indistinguishable from the final midnight at the end of time, stared forlornly at the boxy shadows in the corner of the room. His gaze was still fixed on them when Adelaide returned carrying a tray almost as big as she was. On top of it rested a large mug of, oh yes, cocoa and a plate with a bonsai mountain of mince pies. DeiOS 4.2 – Soul Control from Home. WishScan DDR: Digitising Dreams into Reality. ‘All you need to do is put the letters in here.’ She inserted one of the wish lists into the hole on the front of the machine, ‘and they’ll be scanned in and automatically categorised and added to the list.’ A message flashed on screen: Scan Complete – Behaviour Checked – Gifts Assigned. Orientation Error – 0x07338D93 – Change Position And Try Again. ‘No, Father, it means the paper was the wrong way up. Here see, put it in as if you’re about to read it.’ Adelaide showed him the correct way and, once again, the document disappeared in a small puff of enchantment. An hour later, Adelaide finally closed the door behind her. She had shown him how to view the scanned letters, look at the lists and search through the names or gifts. He told her he was just going to try a few on his own before he went to bed. The next morning Adelaide prepared the Chief’s breakfast, placed it on a tray and proceeded to his office. Opening the door she was surprised to find him crouched over the machine, ‘Come here, Adelaide, this is amazing.’ The letters, which were previously in two piles almost to the ceiling, were now all but gone. The old man fed another in and watched it disappear into the device. As he turned to Adelaide she saw that the whites of his eyes were tessellated with tiny blood vessels and there were dark rings round them the colour of coal. It was obvious that he hadn’t slept. He fed another letter into the machine and gave a satisfied smile as it disappeared into the mystical ether. Adelaide watched as he continued to robotically insert the wish lists and checked the Naughty List, the Gift List and the occasional letter for scanning errors, to make sure a recipient was going to get what they had asked for, rather than a toy house (horse! ), radio controlled chipper (chopper!!) or a solitary parrot (Monopoly!!!). ‘No, no. I think I’ll just have a bit of a sit down for a while.’ As Adelaide pulled the door shut he collapsed into the comfy chair next to the fireplace. After a few minutes there was a deep breath and then snoring. In his dreams lights flashed and speakers blared, a series of terrifying machines marched through his mind, electronically yelling a chant which sounded, for all the worlds, like “we’re going to take your job old man”. ‘Hmm, takes all sorts,’ the old man said. ‘Could you get me some parchment and a stylus, please?’ When he had thought for a minute he started scratching out some beautifully choreographed words on the page. He left the room as Adelaide read the note. When she was done she turned round to find him in a noisy Hawaiian style shirt and shorts. She said ‘Um…’ as that was all that came to mind. So, with all that inspiration flowing through the internet, my head, my dreams and my life in general, I have a lot of ideas trying to vie for attention when I’m sitting in front of a keyboard. I have covered some of these already but just skip over them if you get bored. To give you an idea tonight I’m going to write down a few of the ideas that I have at least written down somewhere. if you like the sound of any of them please let me know and I’ll consider expanding them or at least trying to think of how to proceed with them. 1. A Brief History of the 4th Millenium – My Mum is an archaeologist and after writing my time travel book (see 4.) I had an idea that it might be a good idea to write a laymans history book, only it’s a history of the next millenium, from the year 3,000 to 4,000, as if it were written at the end of that time. 2. Back. A story about humankind messing up the planet, emigrating to the moon for a thousand years or so, then trying to recolonise the Earth. Suffice to say it isn’t a joyride for the people coming back. 3. Devamped. I was always planning this to be my second book, I have a few ideas banging around inside my brain but need to get on and write something. It’s about a vampire of a couple of thousand years who has his soul forcibly returned and has to live a normal life. It’s going to be a comedy and will revolve around the humdrum everyday life of the poor fellow who has spent several hundred years being invulnerable, invincible and generally rather popular with the ladies. 4. 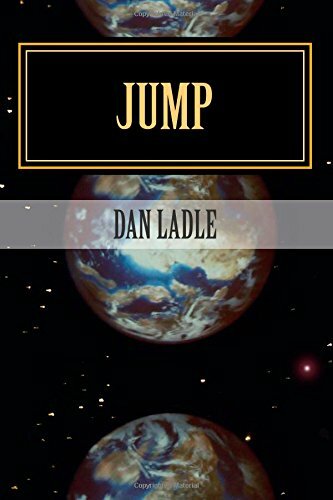 Jump – You already know about this one. It’s a book about a time machine that causes catastrophic environmental changes to the planet (seems to be a theme!!?!?) and needs to be cleared up by the team who run it. This one is finished so I can’t really do a lot else with it, apart from publication. Which I’ll come to another night! 5. Where Did I Come From? – A book for toddlers on evolution, where a kid asks his parent, who works in a natural history museum, the question from the title and is answered with evolutionary ancestors back through time. I’ve done quite a lot of research for this and just need to get the words down in a pleasant sounding way for young ‘uns. 6. MAI – A story about a guy at a university who creates a computer hosted Artificial Intelligence and his successive relationship with the personality that arises therein. Not a “relationship” actually, just the back and forth between the two of them. Never got very far with this so don’t really know where it was going to end up? 7. Rock – About a diabetic guitarist who gets framed for the murder of one of his bandmates and is sent to prison. Then how he escapes and clears his name. Required a lot of research, which I don’t really have time for at the mo’. 8. Super – I think the film My Super Ex-Girlfriend may be a bit too close to this but it was going to be about a guy who dated a woman who turned out to have superpowers. Again, never really got round to planning it so might need to trash it or think harder about how to differentiate from the existing, slightly rubbish movie. 9. Turing – A working title, another Artificial Intelligence one but this one has a malevolent AI that gets out of the lab and starts causing havoc with computer systems around the world. the nice thing being that just about everything is computerised these days so it pretty much has free reign to do what it wants. a. A Word About God – Similar to 9, but based around a simple conversation between a researcher and an AI about religion. b. Getaway – A space ship is leaving the earth to avoid a meteor collision ending life on the planet, can’t say any more without giving the twist away. c. Nothingham – Post apocalyptic, a couple end up in a UK city. I’m doing this one at the moment for a writing competition so won’t say too much. d. The Dark Mark – I wrote this for a friend who is a photographer, inspired by a set of his pictures. It’s going to be on display at a gallery before too long so, again, can’t reveal too much. Suffice to say it’s a bit on the depressing side. I have other ideas but most of them are in my head so have yet to make it into some kind of electronic form. Gotta go now, it’s bed time.